Learn everything you need to know about the state of the debt market and the current loan products available to self-storage owners and investors, including structures, rates, terms, costs and more. Learn everything you need to know about the state of the debt market and the current loan products available to self-storage owners and investors. 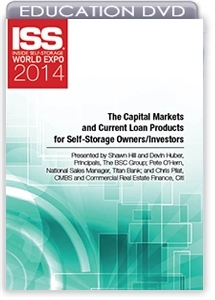 During this informative discussion, lenders and mortgage professionals will provide a comprehensive overview of the debt products available for self-storage including CMBS, insurance company, bank, credit union and Small Business Administration loans. They will also cover a state-of-the-market update on the loan structures available, addressing interest rates, terms, amortization, costs and other important features such as prepayment, earn-outs, hold backs, interest-only periods and more.